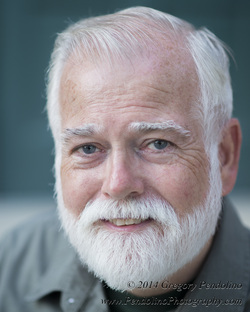 I have been working steadily as an actor and director since I retired in 2013 from the Ohio Department of Rehabilitation and Correction, but I’m certainly no newcomer to theatre, film, and commercials. While serving as an academic teacher in the Ohio prison system (as well as a Certified Hostage Negotiator – that’s a story in itself! ), I kept busy acting and directing at such theatres as the Carousel Dinner Theatre, Ensemble Theatre, Karamu Theatre, Ohio Dance Theatre, Kennedy’s at Playhouse Square, Greenbrier/Cassidy Theatre, Clague Playhouse, and others in Northeast Ohio. A while ago, I got an emergency call to step in to the lead role of Canon Pennefather in Agatha Christie's Murder on the Nile, already in rehearsal at Gretna Theatre. A week to learn the entire play and put it before an audience! The support of my fellow cast members and the entire company was exhilarating, and the audiences loved it! Now, maybe it’s because of my prison background, but I’ve played a lot of bad guys – a presidential assassin, a racist fight promoter, a sleazy petty thief, an underhanded business executive, a crazy scientist, and a mean, fugitive-catching bounty hunter. In June I played not-very-nice-guy private investigator Mike DiMaggio in Nikkole Salter's devastating play, Lines in the Dust. But every year it’s my privilege to "be the best friend of" the most lovable guy in the world, Kris Kringle, at Cleveland’s famous Kris Kringle’s Inventionasium. play The Value of Names, especially because I was sharing the stage with my brilliantly talented actress/singer daughter Nicole Corris. I directed another of Jeff Sweet's plays, American Enterprise, which played to sold-out houses at Lorain County Community College and boasted a great mix of students and community actors. In April, I was pleased to direct for the college an original musical, Blooms of Steel, about several generations of Lorain, Ohio steelworkers. I’m looking forward to being onstage again with my son, too (we did Oliver! together a few years ago). He’s actor/puppeteer David Colston Corris. Nicole (nicolecorris.com) lives in NYC; after six years on the road, David is in Chicago for a while. Check out their websites. Maybe you’ve got an idea for a play or film for Nicole, David, and me to do together! If so, drop us a line. And while I’m talking (okay, boasting) about family -- my youngest, Michael, is also living in Chicago. He’s a dynamite singer and artist (made it to the Chicago finals for American Idol) who shuns the limelight now in favor of managing Fuga Italian Salon and Spa, one of the absolutely coolest spas/salons in the CHI, with two convenient locations, downtown and on Southport. Stop in and say hi to him -- Michael and the gang’ll make you feel right at home. Keeping us all sane is Mom. Roseanne and I look forward to celebrating our forty-third anniversary in July, and how she keeps it all together, I’ll never know, but she’s quite a miracle. So take a few minutes to look through my site, check out my resume, listen to my demo, click on the vids, and hit me up. Whether you need a mature, active senior, a versatile stage/film actor or a friendly voice, I'll be there for you.